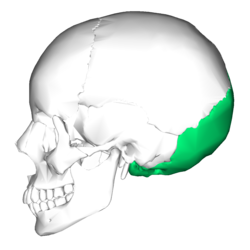 Human skull (Occipital bane is at bottom richt). 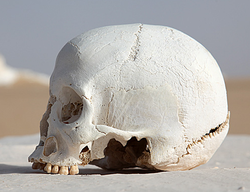 The occipital bane /əkˈsɪpᵻtəl/, a saucer-shaped membrane bane situatit at the back an lawer pairt o the skull, is trapezoidal in shape an curved on itself. This page wis last eeditit on 22 August 2014, at 00:19.